The largest easel is 22.885 m (75ft 1in) tall and 10.668 m (35 ft) wide. It was made by Gurmej SinGh aka Mr. CAUTION of Kalamazoo, Michigan, USA, and was measured on 23 September 2009. 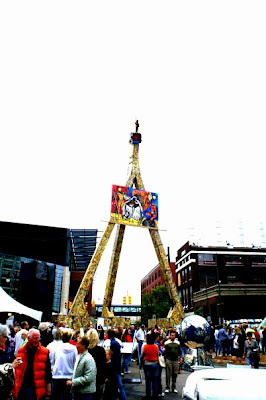 World’s Largest Easel was displayed at "THE BOB" in Grand Rapids, Michigan, USA during the world’s largest art contest--Artprize 2009. Mr. Caution stood on the world’s largest easel for 7 days without coming down to celebrate equality among all. The Easel was designed by Mr. Caution with the help of Grand Rapids Company JDH Engineering. The event was sponsored by THE BOB and JDH engineering. The entire easels outer layer was drip painted by Mr Caution with bright fascinating color palette. Mr. Caution wanted to share his achievement with others even after the show was over and done with. He wanted to make this project a monumental in history. These historical pieces are now available in different sizes for sale at reasonable price at his website: www.MrCaution.com. The idea for this project came to Mr. CAUTION when he heard of the ArtPrize competition and he immediately began to realize his vision. Caution submitted this project as his entry to the ArtPrize competition on September 23 to October 10, 2009. The Kalamazoo Gazette ran several articles on the project. The project was aimed to encourage equality, peace, freedom, and nonviolence in day-to-day life. Caution's intent is to inspire many to fulfill their own dreams through this inspirational piece. The painting depicted Mr. Caution himself performing an art stunt while gazing up at the distinguished figures that have inspired him to follow his dreams: Gandhi, Mother Theresa, and Martin Luther King, Jr.
Mr. CAUTION was to jump of the easel to popularize his revolutionary idea and concept of stunt-painting. "This piece of art is several lines and diagonal lines and geometric shapes and forms. There is a wide varitiy in color and so much of it, that it gives off a texture. And there is a pattern of randomness on the whole of the peice of art." "The thing that really caught my attetion was the size and the fact that yes the person up there was real and moving and yes it was the artist."